34 years ago today, Andalucía became an autonomous community of Spain. 28th February, the regional holiday of Andalusia day, is a celebration not only of autonomy but of what it means to be Andaluz! 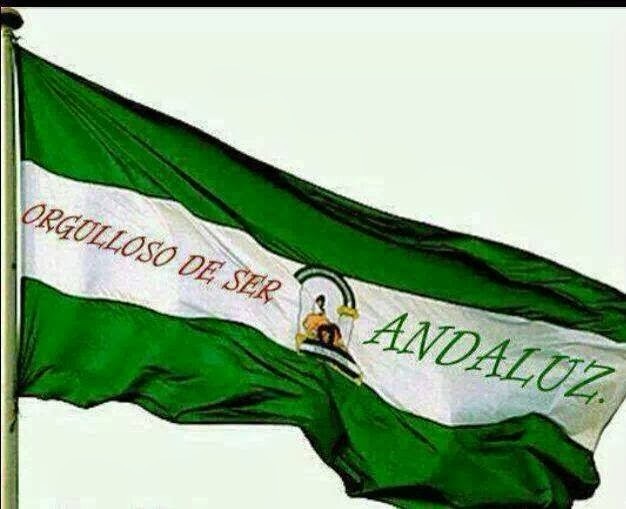 Having asked my students what Andalusia day means to them, it seems that its not very widely celebrated except in the schools. Children across Andalusia will be treated to a traditional Andaluz breakfast served by their teachers - a glass of orange juice and toast spread with olive oil. They will colour the regional flag, learn about the symbols of the area and also perform the regional anthem (usually on the recorder). Particularly proud residents will bring out the bunting or decorate their balconies with flags, but it seems for the adult population of Andalusia, Andalusia Day is little more than an excuse for a lay in and a lazy lunch. Wanting to fully experience the joys of Andalusia Day, as celebrated by true Spaniards, I have done practically nothing! Woke up, pondered going in to town but decided against it and decided the day would be best spent studying. No sooner had I written one word on my page than I was being ushered out of the door for lunch in the sun in the village. Luckily Eva, my boss, had booked a table because the place was buzzing. They had set places for us inside but when they saw our faces of disappointment at turning our backs on the sun, they told us to take it outside if we wanted. So that we did, we picked up our table, chipped plates and all, and put it in prime position on the terrace! This restaurant 'The Four Corners' has the kind of atmosphere I'd always expected to find in Andalusia: full of life and chatter whilst everyone basks in the sun, the children running around the terrace, shrieking with laughter. It was like eating in your nan's back garden when the whole family is round for a BBQ - mismatched china and furniture but a lot of character and soul. The food, as ever in Spain, was homely, plentiful and delicious, washed down with a cold beer as every kind of topic of conversation was batted around the table (from the latest trend in sunglasses to Turkey's possible entry in to the European Union). Beef in the best sauce you will ever taste! As much as I love teaching the kids, I would take fiesta Fridays over adjectives and the past tense any day! Bellies full and with the afternoon winds whipping up, there was nothing left to do but take a gentle stroll home. Writing this, eyes drooping, I'm thinking 'what better way to finish off the afternoon than a siesta?! '...guess it would be rude not too.